The benefits and drawbacks of living in a tiny home. Imagine walking in the door to your home and, with a single glance, being able to see your entire living space. Before you is the bedroom, the kitchenette, the bathroom, and a small living room. Every item has a specific purpose and place, and you own nothing that you don't use, need or want. And cleaning your home from top to bottom takes less than an hour. Spending time in your home means living closely with your spouse or partner. Instead of watching TV or reading in separate rooms, you do these activities together. Your energy bills are minimal because there's less space to heat and cool, and you waste less food because you don't have a large fridge or pantry where it can get lost. As a result, you save a significant amount of money each month. When you look at it this way, living in a home that's less than 500 square feet sounds simple, frugal, and blissfully stress-free. Living in a tiny home does have compelling benefits, but it is not without its challenges as well. There are plenty of good reasons why some people choose to live in a home that's less than 250 to 500 square feet. These homes consist of only a few rooms--usually a kitchen, living area, and bedroom. Other tiny homes are completely open, like a studio. 1. Less Clutter. When you have a tiny home, filling it full of "stuff" is not an option, at least not if you actually want space to move around in. When your home is small, you have to make some hard choices about what to keep, and what to get rid of. This means you can't go out and buy frivolous items whenever you're feeling bored or blue. 2. Less Time Spent Cleaning. Cleaning two or three small rooms takes far less time than cleaning seven or eight large ones. Cleaning also goes faster because you don't have knickknacks and clutter to pick up or clean around. 3. More Savings. Living in a tiny home saves money in many different ways. You don't spend as much on heating, cooling, property taxes, or home maintenance. You save money on groceries (since you have a smaller pantry and refrigerator), and you cut idle shopping almost entirely out of the picture. 4. Higher Quality of Life. Many tiny homeowners state that their quality of life and overall happiness improved when they shed their "stuff" and started living small. There are many reasons for this: They don't feel weighed down by all the frivolous items they used to own or a huge mortgage, and they spend less time and money cleaning and maintaining their home, which allows more time and money for leisure activities. 5. Lower Carbon Footprint. Lastly, all of these benefits add up to a major benefit for the environment. Tiny homes are green homes, as they use less energy, produce less waste, and consume less resources (in the form of products that are no longer being purchased) than larger homes. Many people have bedrooms or even closets that are larger than these tiny homes. And the thought of squeezing all of your worldly possessions into such a small space can be daunting. 1. Organization Is a Must. You need to utilize every organizing idea for small spaces, otherwise your tiny home will look like a cluttered closet. You won't want to spend time there. 2.You Can't Have It All. It can be difficult to decide what possessions to take with you into this tiny space, especially if you have abundant or large family heirlooms. 3. Entertaining Is a Challenge. Entertaining in a tiny home has limits. In warm months you can go outside, but winter can force you to limit your guest list. In spite of the challenges, the idea of living in a small house has been gaining popularity in recent years, especially since the recession hit. 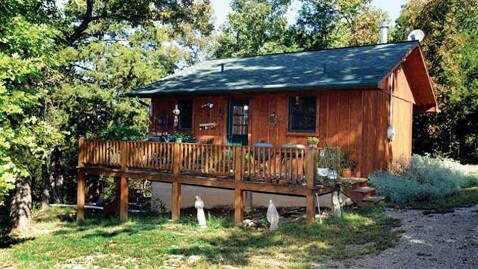 In 2003, Kerri Fivecoat-Campbell and her husband Dale built a 480 square-foot lake house in Bull Shoals, Ark., to use as a getaway from their busy lives in Kansas City. Their original plan was to build a 1,000-square-foot home on their 30 acres, and use the little lake cabin as a guesthouse. But when her mother passed away in 2007, Fivecoat-Campbell realized she needed to get out of the city, so she and her husband decided to move full-time to the Ozarks. Unfortunately, this move occurred just as the economy began to sink into a recession. The couple realized they didn't want the big mortgage that would come with building a larger home, so they decided to try living in the little lake house permanently. The couple had plenty of furniture and other possessions they'd accumulated over 20 years of marriage. And with her mother's passing, Fivecoat-Campbell also had another houseful of treasures that she found it difficult to part with. Paring down all these possessions to live comfortably in such as small space was no easy task, especially in the first few months, and it's still something that she struggles with. "I had to pick and choose not only what I loved and wanted to keep, but the items had to also serve a purpose in a small space," Fivecoat-Campbell says. "We don't have the luxury of having hall trees and vases sitting around for looks. My mom's favorite reading lamp is now my bedside lamp, and her antique dresser is our one and only dresser. An antique dry sink is a coffee station in my office space. We're still dealing with some of the stuff, what to give away to charity and what is worth selling. It's a process." Another challenge is the couple's six dogs, all which have been rescued from either the side of the road or the local animal shelter. Fortunately, the mild weather in Arkansas allows many of the dogs to lounge on the front porch much of the day, but everyone sleeps inside at night, which can be "quite a game of Twister," Fivecoat-Campbell states. But, she wouldn't have it any other way. 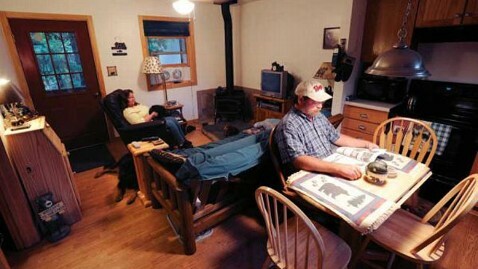 Over the years, the couple has added to their living space in the form of extra buildings. They built a small storage shed and basement on the property, which also doubles as a tornado shelter. Here, Fivecoat-Campbell stores many items she can't bear to part with yet. She also works at home as a full-time writer, blogging about her life and the strategies for living in a tiny home, at Living Large In Our Little House. So, she and her husband also constructed a small building to use as an office. Although there has been a big learning curve to living in such a small space, Fivecoat-Campell doesn't dream of transitioning to a larger house anytime soon, if ever. She loves living in such a small home because it's actually brought her and her husband closer together. "I love the fact that my husband and I sit in the same room and watch the same shows on television, or have a reading time at the same time. At our larger house in the city, he would usually retreat to the family room, while I went to the bedroom to watch something different or read in the formal living room. Our large house was keeping us apart and we didn't even realize it." There are several ways you can maximize the space of a tiny home. These tips can also help you gain control of the space and clutter of a larger home as well. 1.Head Outside. Fivecoat-Campbell recommends doing whatever you can to maximize your outdoor living space. Being able to cook outside, or enjoy an afternoon thunderstorm on the front porch will make living in such a small space less of a hardship. A large deck or front porch can make the home seem bigger, especially if you like to entertain. 2.Declutter. Limiting the possessions you own is a key element to living successfully in a tiny home. Fivecoat-Campbell has a strict rule: Everything in her home has to be loved and also serve at least one purpose. "Every piece of furniture in our home, every lamp, makes me happy, and they all serve at least one purpose," she says. You can also make a "one in, one out" rule. That is, if you bring anything new into the house, something of equal size has to go. 3.Maximize Space. Maximize storage by looking at spaces that often go to waste. You could store clothing in bins under the bed, or choose a bed frame that includes several drawers beneath. Built-in benches for a kitchen or deck table could also double as storage space. Final Thoughts It's hard for many people to envision living in a tiny home. But for some, the benefits far outweigh the inconvenience. Having more free time, less worries, no clutter and more money to spend often equals a higher quality of life. However, as more Baby Boomers start to experience "empty nest" syndrome, and more young families find it difficult to get approved for a home mortgage loan, chances are that the Small Home Movement will continue to grow in popularity. Fivecoat-Campbell is extremely happy in her tiny home, and she's not planning on going larger anytime soon. Do you live in a small home? If not, would you ever consider making the move? See the Moneycrashers.com site for more on homes, real estate, banking and credit.